A full day workshop, or 2 half-days better yet, also online: Preview this workbook immediately! As a manager and team leader, you and your organization invest significant resources in developing your employees and building a dynamic corporate culture. Hiring qualified employees who perform well and fit in sounds easy, and it can be, with the right skills. A successful hiring process does not start with the job posting or end when a candidate has been hired. To make sure your employee search is successful, an efficient and consistent hiring process must be in place before a position is even posted. As a team leader, it is important for you to have time to identify job competencies, build interview questions, and develop a hiring strategy. 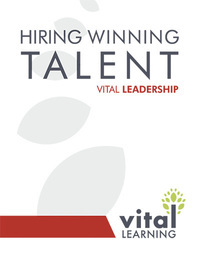 The Vital Learning Hiring Winning Talent™ course equips managers and team leaders with proven processes and tools to help them master the art and science of identifying and hiring great employees who will consistently perform in the top 20 percent of the organization. Leaders will learn to implement a structured process that can streamline and enable successful hiring. Click on the “e” to immediately enroll and begin the Hiring Winning Talent online course.